 Public Lab: Aerial Mapping Drone for Under $60? ajawitz was awarded the Basic Barnstar by danbeavers for their work in this research note. I want to build a very low-cost, programmable, UAV that can be used for the purposes of grassroots mapping and citizen-driven research. Whether used by farmers to monitor the health of their crops, environmental researchers to collect water temperature data or even archaeologists to view soil patterns from the air, unmanned aerial platforms are gradually becoming essential civilian research tools. Even so, for the vast majority of people around the world, autonomous aerial vehicles represent either scary military killing machines, or expensive toys for rich people. While citizen-scientists, grassroots researchers, humanitarian activists etc…​ have grown to recognize the enormous potential of having access to such technology, the dominant perception is still that it can only be achieved at significant expense. After-all, simple economic logic dictates that technological capability is directly proportional to monetary investment (in other words 'you get what you pay for'). It would seem a reasonable expectation then, that a flying robot capable of autonomously navigating a precise flight plan while deploying an assortment of 3D mapping cameras and sensors, would require significant monetary investment. This might have been the case in the past, but thanks to a unique process of open source development, it is very much possible to have an aerial mapping vehicle with considerable capabilities for less than $200!!! More than that, it should be possible to build almost the entire aircraft out of relatively common, off-the-shelf components and free (as in "beer") software! Yet its possible that the complexity of such achievements have actually made it more difficult for non-experts to take advantage of such enormous potential without becoming drone hobbyists themselves. Effective documentation written for non-experts (or rather people who might be experts in other fields...) is therefore necessary for the technology to reach its full potential. 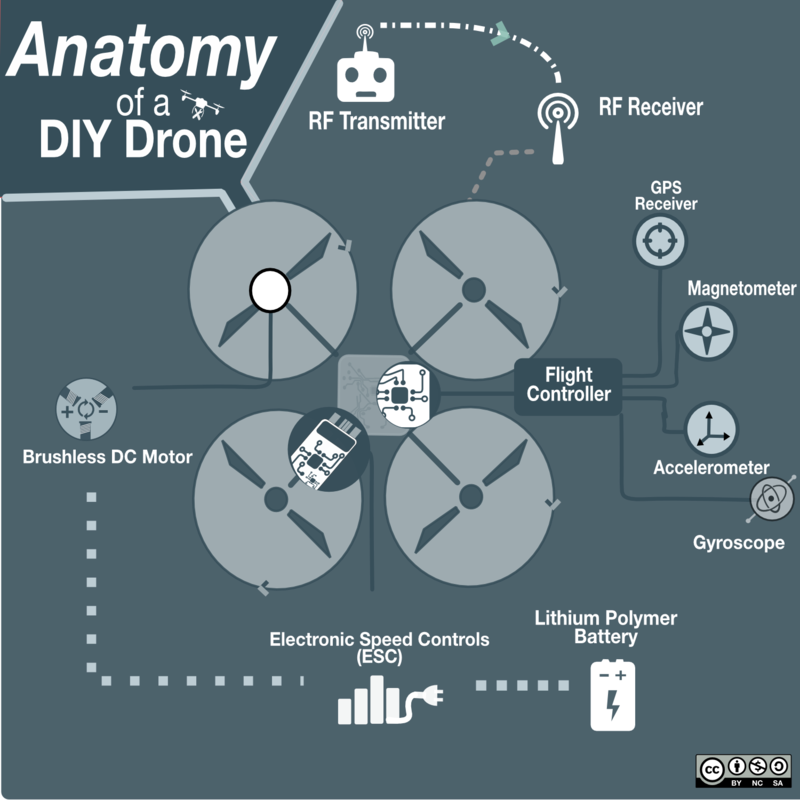 Whether fixed-wing and multirotor, most "diy drone' configurations share some very basic components. The following "Anatomy of a DIY Drone" graphic outlines some of the most basic components shared by most diy drones currently. 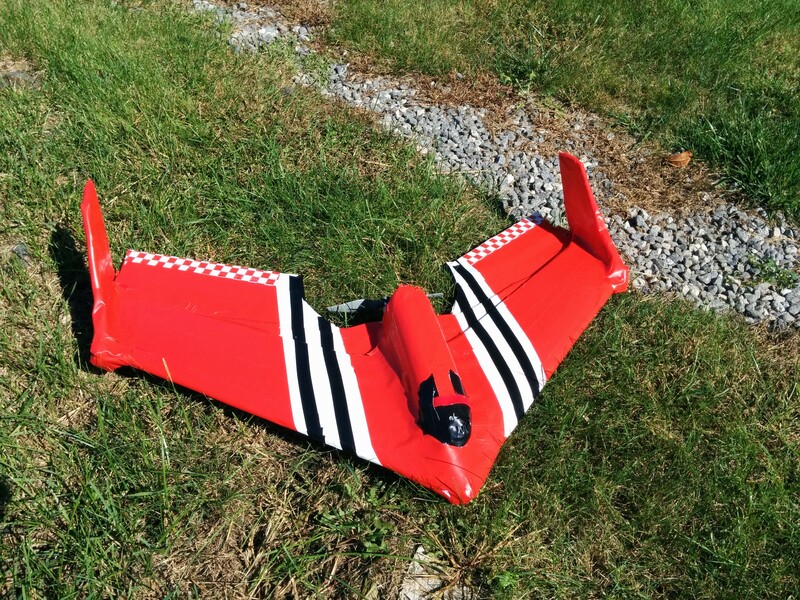 Fixed-wing models differ in the fact that they require only one motors+ESC each. With affordability as a key project parameter and the fact that aerial mapping generally requires broad area coverage, a fixed wing aircraft seemed the obvious choice when I first began this project. However, I soon discovered it was much more difficult to find online documentation for fixed wing aircraft then it was for a quadcopter setup. Seeing as online documentation remains my primary resource, this turned out to make the fixed wing setup much more of a challenge than I expected. Using the quadrotor as my testbed, I've been able to find ways to build almost every component, other than the brushless motors, using off-the-shelf components and significantly cutting the cost in the process. 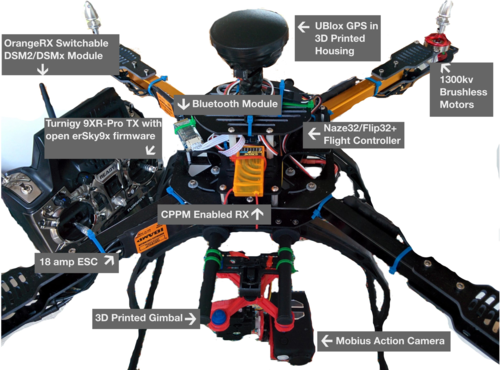 The expectation of such an ambitious project is not so much for beginners to go out and build a 100% DIY UAV right away, but rather to demonstrate how certain components can be built from scratch if need be. Furthermore, one can imagine the documentation for each component requires a good deal of detail for which it would be impossible to fit into a single research note. Therefore, this research note will serve more as a summary, while links will be provided to more detailed documents for each step of the process. Flying Wings are often used for Aerial Photography, especially in the agricultural sector as with this company in North Dakota. A wing even makes a guest appearance on an episode of the PBS series "History Detectives" (appearing at the 25:30 mark) when they map the location of a wrecked Civil War steamboat. My current flying wing build combines design elements from two popular build types. The first method outlined in this Youtube video utilizes a simple method known as the Kline-Fogelman Airfoil by layering pieces of foam board found in any dollar store, while the other method, known as the WallyWing utilizes premolded wings and fuselage from a $10 foam glider toy. I even used the exact same propellor, which turned out to be a smart choice as it easily could've required additional adapters etc... if I had chosen otherwise. The result is an especially strong airframe with a broad wing area and a perfectly tapered leading edge. Additional structural elements like steel rods and carbon fiber tape add structural reinforcement and bring the cost of base materials to roughly $25. As impressive as the flying wing airframe is in of itself, its potential as something truly useful comes down to its electronics. 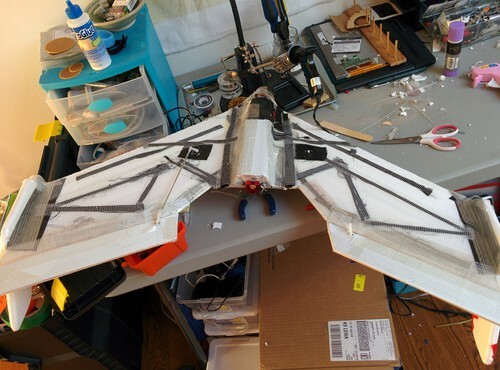 Until somewhat recently, the development of DIY UAVs mirrored closely the popularity of the Arduino microcontroller board. Microcontrollers (MCUs) have existed for years in hobbyist/electrical engineer circles as a means of converting analog signals into digital data and vice versa. Arduino changed the game by creating a simplified programming method that could be accessible to virtually anyone regardless of expertise in programming or electrical engineering. 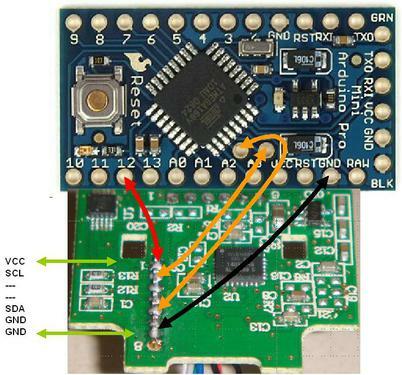 The 8bit Arduino MCU made it possible for the two pioneering open source projects, known as MultiWii and Ardupilot through which most modern DIY UAVs are derived. Of the two original autopilots, MultiWii tended to be more oriented towards manual "sport" flying while Ardupilot was oriented more towards automatic flight controls. This distinction has become less defined as more autopilot features have been added to MultiWii and its more derivatives. There is one distinction that has only intensified as MultiWii evolved into 32bit Platforms such as Cleanflight and Ardupilot evolved into APM and later Pixhawk,.. 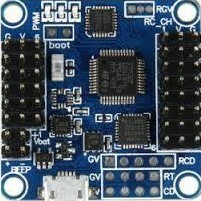 The Pixhawk and other Ardupilot derivatives or significantly more expensive! For example, the standalone Pixhawk flight controller currently retails at $199, whereas a MultiWii derivative known as the Flip32+, which has roughly similar capabilities is currently sold for $27. Such an extreme price difference was a major factor behind why I ultimately chose Multiwii when I first began this project. But it wasn't the only factor... The other factor is hinted at in its name... In its original incarnation, MultiWii allowed users to program vehicles with high performance, navigation capabilities using nothing more than an Arduino board and Nintendo Wii remote! 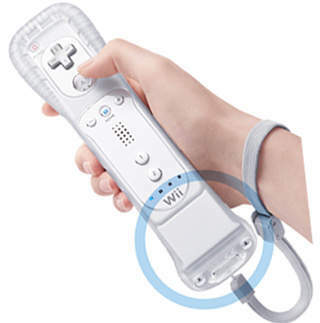 The Wii Motion Plus was an additional plug-in component to the Wii Remote that contained three gyroscopes capable of detecting altitude. Until recently, buying these gyros individually would be cost-prohibitive, but by buying them in bulk, Nintendo was able to sell the manufactured product for less than the cost of the individual sensor. The fact that the platform was created around this very simple premise has ensured it retained this DIY emphasis even as more advanced, integrated units like the NanoWii have advanced beyond the original hack. Unfortunately, there are no 32Bit equivalents of the Arduino Pro Mini, and the only 32Bit hardware currently supported by the Arduino platform, the Arduino "DUE", is far too unwieldy to use as a flight controller. An increasingly popular Flight Controller called the Naze32 was developed for a version of MultiWii that was adapted for use on 32bit boards. At less than $30, the "all-in-one" flight controller is comparable in price to the original "NanoWii" board I began the project with. Various Naze32 clones like the Flip32+ pictured below can be found for roughly $30. STM32 Unlike the 8bit ATMega microcontrollers manufactured by ATMEL, the Naze32 and many other new FCs are based on a family ARM-Cortex chips called the STM32. The STM32 can be purchased in any number of evaluation kits in a form resembling an Arduino. 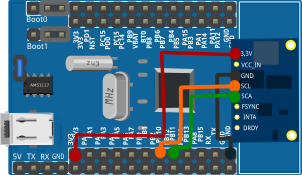 However, support for programming these boards using the popular Arduino IDE is only in early stages as of Arduino 1.6.0.. This has proven to be a major challenge, as the chief advantage of the Arduino IDE is in its ease of use and accessibility for non-programmers. While the STM32 has its own programming utility, it is far more technical than a non-expert would be accustomed to. 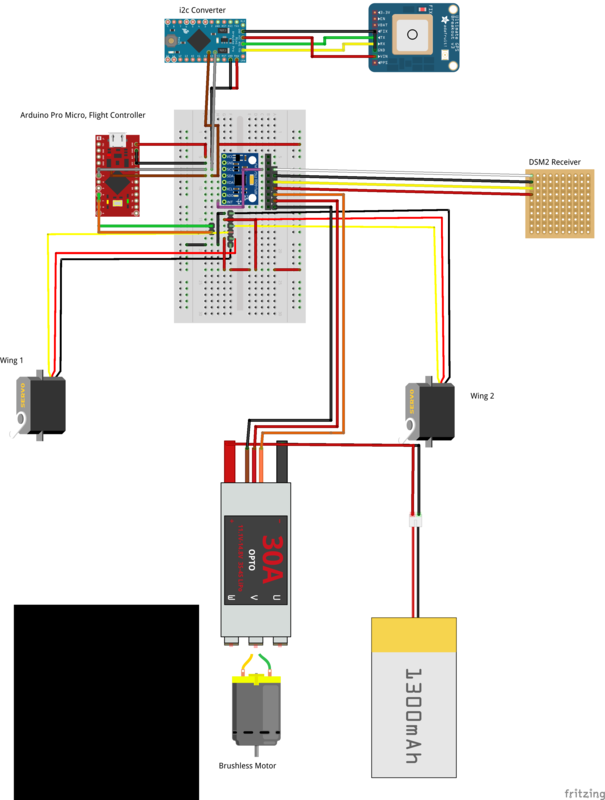 I have attempted to address some of these problems through a more detailed walkthrough which can accessed here- https://cribstone.github.io/humblehacker/2015/08/28/A-DIY-Flight-Controller.html Alternately, the step by step tutorial that I used can be found here- http://www.rcgroups.com/forums/showthread.php?t=2154329. *An STM32 development board such as this one available for roughly $6! Alternately, a "10DOF IMU" like the GY-80 or a GY-86 combines all of the above-mentioned sensors into an integrated unit. The following graphic illustrates illustrates a DOIY Naze32 with connections to a GY-86 module. While Multiwii is intended for Arduino-based hardware, a 32Bit fork of the original MW firmware called Baseflight has become a standard on its own accord. A great advantage to Baseflight, and another derivative called Cleanflight is in its accessible interface via a web app. Nevertheless, the fact that I would be starting from scratch compelled me to test with a "factory" produced Naze32 before attempting the DIY method outlined above. Once I got the board, I found both Baseflight and Cleanflight to be as easy as launching the webapp via the Chrome Browser, selecting the correct firmware for my board and flashing it. Additional sensors like GPS, Bluetooth etc... can all be configured directly from the GUI A command line interface is also available for custom functions. As much as I loved the DIY nature of the old Arduino/Processing driven MultiWii Gui, the webapp interface is a major improvement. Furthermore, it smoothes over a lot of compatibility issues arising from different versions of MW. While Baseflight is the default firmware for the Naze32, I quickly found Cleanflight to have better support for GPS navigation, and for new features in general. It should be noted however, that the Naze32 was originally more oriented towards RC enthusiasts who preferred manual controls over GPS navigation. Therefore, features like Mission Plotting etc... are only recently making their way into the code base. 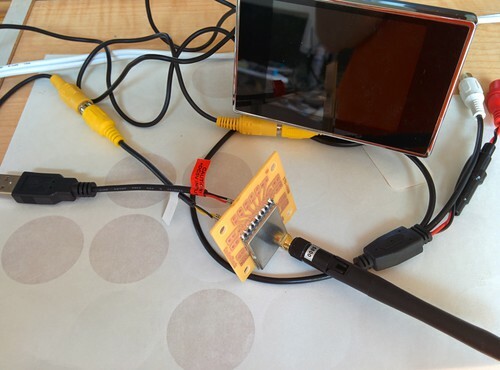 It also resulted in my having to buy a new transmitter that could support "CPPM Mode" as a standard transmitter use the serial port required for the GPS to function properly. The DIY Naze32 build requires an additional programming step, outlined in details on the DIY Flight Controller post. Basically, a Baseflight/Cleanflight HEX file must be flashed using the STElectronics Flash Loader utility. The procedure can be tricky as bootloader mode can only be triggered when the two jumpers are in the right position. The above-mentioned post includes detailed visuals to help in this process. 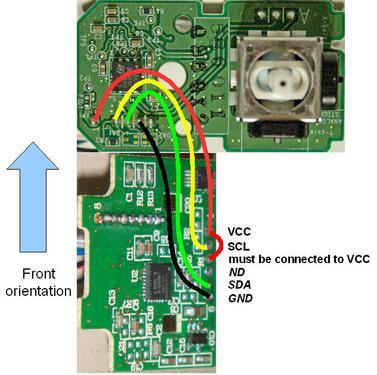 Once Baseflight/Cleanflight has been flashed to the board, and the sensors have been connected, it should function as well as any Naze32 Flight Controller! 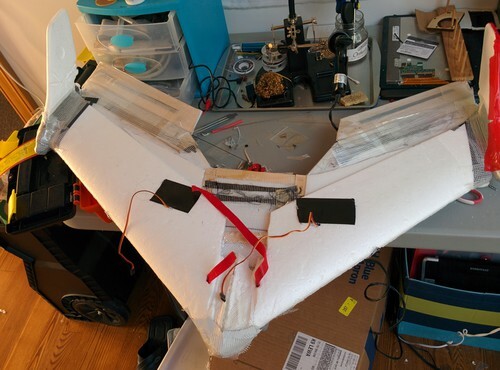 As mentioned previously, the design is similar to a basic KfM2 Zephyr Wing only it uses premolded wings from a toy glider for the leading edge where the original design calls for a piece of 1 inch pink foam insulation. 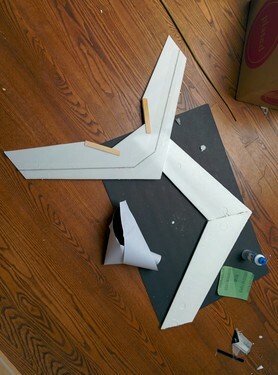 I accomplished this by cutting out the main structure in dollar store foam, while using plastic pins and glue to bring the two wing halves together at a 30 degree angle. The thin bottom board was reinforced with thin steel rods and popsicle sticks on the edges where ailerons are attached. 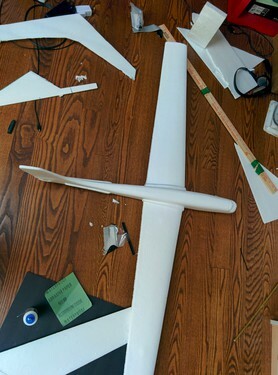 With the two pieces glued together, I then used the tailfins from the toy glider as the stabilizer fins and added ailerons made of balsa wood and a piece of plastic covering. Slots were cut about two inches from center on both sides for servos which control the flaps through thin steel pushrods and plastic control horns on the flaps. Additional structural reinforcement was added by applying carbon fiber strips with fast-drying epoxy. I can't stress enough how amazing carbon tape is! For little more than $7 you get incredible strength with neglibile weight difference! Mesh hinge tape and Vinyl marking tape provide the final covering layer. By far the most challenging aspect of the design was how to incorporate a space for the camera and electronics that stays shut while in flight but also allows for easy removal and/or adjustment on the ground. I did this by cutting the glider fuselage into two halves for which the bottom half would house the camera and the top half would house the electronics. 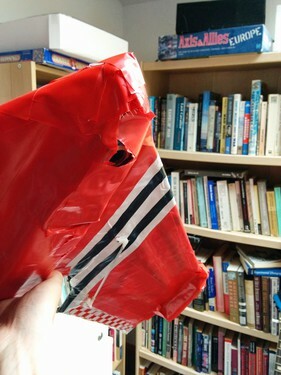 The top half was taped on one side to form a hinge, while a velcro strap wraps around to secure both halves of the fuselage while in flight. 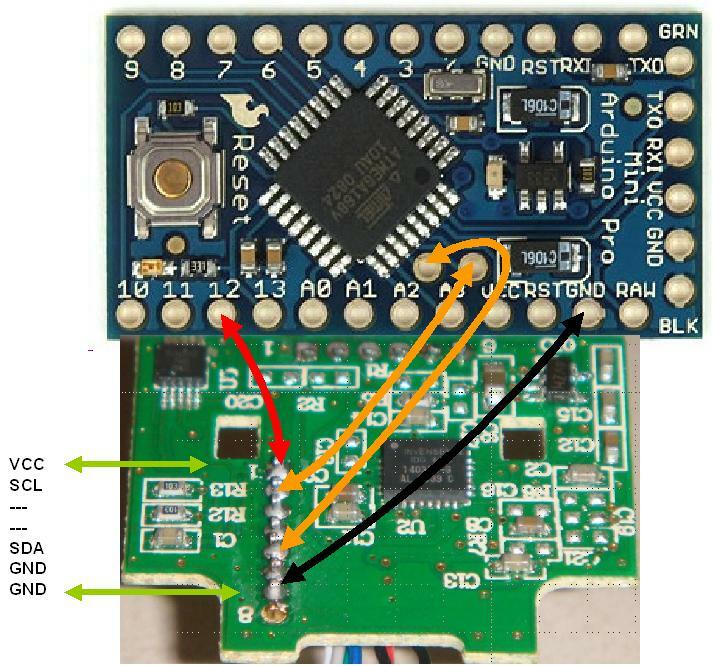 For the flight testing/prototyping phase (or Pro Micro etc...) I used a miniature, ATMega32u4 microcontroller called the Lil'Nardo because its open headers don't require soldering connections directly and allow for rapid reconfiguration. 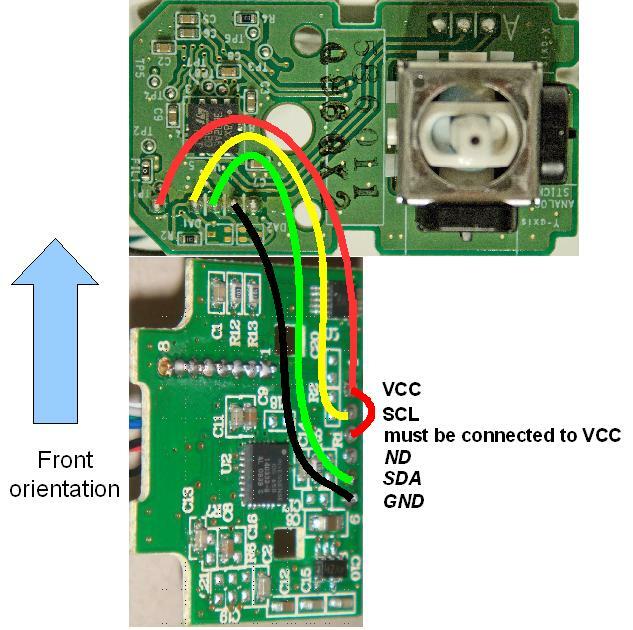 However, this did take up more space and requires a separate sensor board through which the power, transmitter, servos and sensors would be routed before connecting to the controller through standard jumper wires. The camera housing was created by cutting a section out of the bottom fuselage and hinged and secured with the velcro strap. 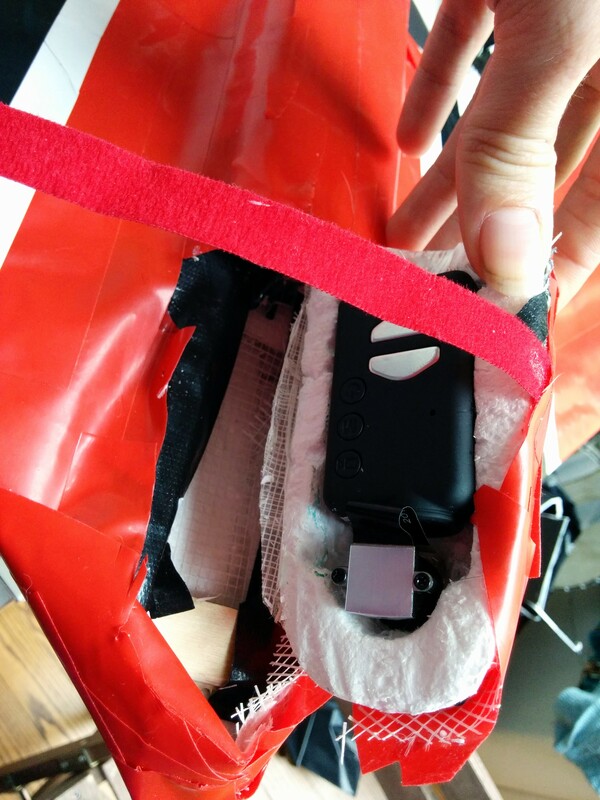 The Mobius Action Cam can then fit into the housing with its lens detached and fitted to an opening in the bottom of the aircraft. While many options exist for viewing and controlling live camera feeds from UAVs, It seems that the vast majority of camera+flying wing information is oriented towards a First Person View or "FPV" setup. FPV usually involves a front facing camera transmitting real-time wireless video to a "pilot" wearing a headset similar to the old "virtual reality" goggles. The pilot can thus control his vehicle as if he's flying himself. With the cost of FPV equipment getting cheaper and cheaper, this method is fast becoming one of the most popular means of RC control. Unfortunately, at least in my view, it has very little relevance to the field of aerial photography. Though, there might be great potential for mapping using live video feeds, I can't think of any use for FPV goggles, as I would want to include as many other people as possible. Nevertheless, after doing some research on wireless video transmission, I was happy to discover that I already have most of the pieces required! 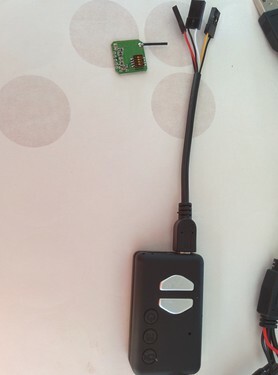 The tiny transmitter will be connected to the camera via the USB adapter. The only issue left to resolve is whether or not the Mobius battery will be enough to power the TX or if I have to connected to the main battery or add a new one. A new research note exploring options for a low-cost LIDAR sensor has been posted at http://publiclab.org/notes/code4maine/09-28-2014/options-for-low-cost-lidar. Such a capability would allow for 3D scanning and open up limitless possibilities! While proving to be by far the most challenging project I have yet attempted, I believe I have already made a very strong case that a programmable unmanned aerial vehicle can indeed be constructed for aerial mapping purposes at very low cost! Already, discussions have begun with various environmental groups about how such a low-cost tool could be deployed to supplement costly overflights to monitor the health of Eelgrass ecosystems in Casco Bay, Maine. have you tested ? is it flying ? how much weight it can carry ? I'm still making my way through the Multiwii configuration to make sure I've got all the connections right. MW is an interesting concept. Its basically just a single Arduino sketch with just about every possible configuration commented out in the setup header. In my case I only had to uncomment out //#nanowii and //#flyingwing to set the basic parameters. Unfortunately, documentation for MW is notoriously tough to navigate so I still need to confirm I'm making the right servo connections before it should be ready for RX/TX binding and finally... flight! 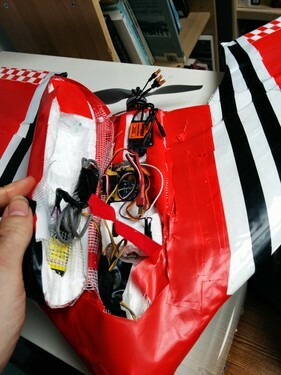 This particular design is well proven and people often use 30 inch foam flying wings for FPV with a GoPro and a big heavy battery up front, so I know they can handle a lot. The overall weight all comes down to how well you balance the Center of Gravity, so Delta Kite flyers should feel right at home with flying wings. I even considered using one of my old Delta's as the airframe but I couldn't find a way to add controllable elevators. As for my own build?... I'll be happy just to get off the ground... My manual airfoil sculpting job doesn't instill me with a lot of confidence, but there's only one way to find out I guess... I'm planning on using a different design based around the wings of a cheap foam glider toy for my actual photomapping vehicle. It does add about $10 to the total price tag but a smooth airfoil might be worth it. This looks awesome! Can't wait to see your results once you finish assembling the flyer! Well done prop might be on the wrong way though.. It's another tool in the kit. I like the approach you're taking to get it going at a low price point. I'll be interested in seeing results. It's another tool in the kit. My thoughts exactly! Its easy to fall into a mindset where citizen science is defined by a particular toolset rather than an end for which any means may fit. For all the expertise one may encounter in "enthusiast" communities like diydrones.com or the Berkeley KAP discussion page the overall emphasis doesn't always align with the goals of citizen science. Which at the end of the day will always be about making high performance tools accessible to as many people as possible. only insofar as the time and resources required don't detract from the larger project. That is certainly key. The tools should lower the barriers to participation and action. On the other hand, lots of members of the Public Lab community spends lots of time trying to get aerial photos, NDVI images, or spectra. A few critical suggestions about ways to improve the equipment or technique could go a long way toward making the results more useful and keeping those people involved longer. It's a lost opportunity when someone is discouraged by poor results. A critical function of a group like Public Lab should be to transfer information about ways to get worthwhile results to the people trying to get them. There is lots of knowledge in the Public Lab Community, and lots of people in need of that knowledge. I cringe every time I see an aerial photo of the inside of a soda bottle or an NDVI image that's all the same color. I see a continuing stream of those disappointing results, which suggests that there are a lot more of them that nobody ever sees. The Public Lab community should work hard to reduce those potential disappointments. Entry level tools have been the strength of Public Lab, but an easy upgrade path should also be available. Public Lab should be known as the source of information about getting quality results, not minimal results. When appropriate, I will always encourage people to use better equipment and techniques, and I am prepared to explain how those upgrades are likely to produce more useful and actionable results. Generally, the answer is that mediocrity rarely slays the giant. @code4maine who on earth would use a quad for long range mapping. You need to be realistic to build a platform that is going to fly 50 times you will need to spend a bit of money. But not more than $250 should do it. If your budget can't stretch then a kite is always ok as well. Who's talking about using a quad? And who said anything about a platform that can fly 50 times? If I fly anything more than 50 times theres a very good chance it will have evolved into an entirely different craft by the time I reach flight #50. People seem to be passionate enough about this issue, which is strongly encouraged, but I strongly request commenters read the full post before posting any reactions. That said, it is an issue that warrants rigorous debate and I for one would really like to join in. I might not have time to set up a new thread for a bit, but if anybody else wants to set one up on either a forum or research note, I'd gladly join in! I love this construction. When I was a kid I got really into building rogallo wings out of balsa and paper or plastic and attaching glow plug engines to them. Wish I had pictures! The wing structure was super easy to build-- draw some degrees of circle on a flat sheet, cut it out and glue to an A-frame. It made a very light flier. Best of all, the weight and balance made it quite stable, although I never got into adding avionics. There's an RCGroups thread on commercial models. FYI- I've made edits to reflect some major updates in how this build is progressing! The design/build phase is finally complete, and while the basic code has been uploaded to the controller unit, I'm guessing it'll still require significant tweaking. 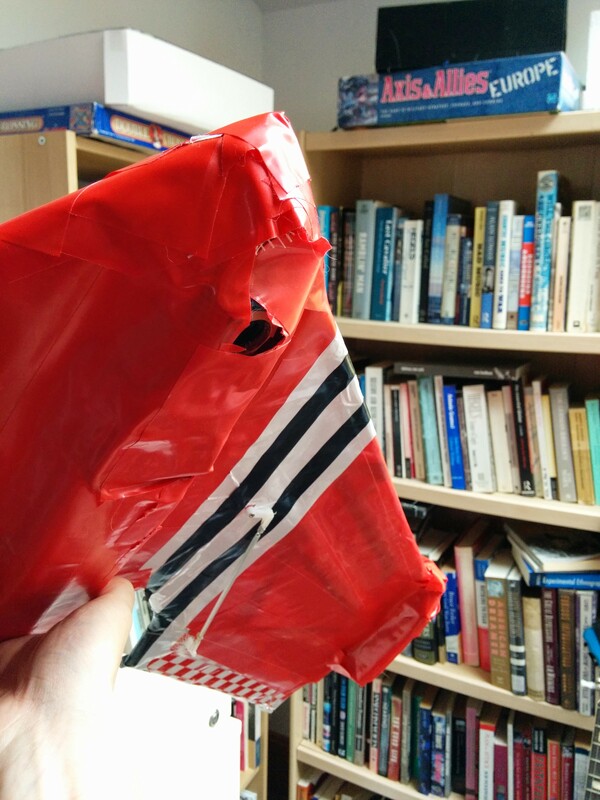 Nevertheless, I should be ready for flight testing as soon as I return from a conference next week! Update: I had a great conversation with Patrick from http://uaviators.org/ about developing this build for humanitarian applications! I look forward to further development in this area! Beyond further refining the MultiWii code this build is based on, one possibility that immediately comes to mind is further integration between flight plotting software and programs like Mapknitter. Thanks for the tip! I have to say, designing the airfoil might've been my favorite part of the whole process! It'll be nice to be able to refine the design once I get through the GPS-NAV challenges! Updated 5/15- I added most recent changes to the section entitled "8Bit vs 32Bit?" Even if this page has been quiet for the past few months, I've actually been working on it quite a bit. Unfortunately, this is mainly because I had to start from scratch in order to upgrade to a 32bit firmware... Now that the weather is warming again, I hope to get in the air soon! Great project. I want to encourage you to continue. I wouldn't worry too much about the cost, Are you posting your notes and code anywhere? As you pointed out, Lidar would be the next obvious step. I work in environmental science in Alaska and this capability is way out of reach unless we are on a government or industry project. My current interest would be to use it to map proposed mine sites and surroundings to determine environmental impacts. We need it - keep it up! Thank you all for the encouragement! This project is indeed very much active! In fact, I have so much to update that I have to decide how much of the original documentation to keep since it could be useful for others. As an interim compromise, I've been posting more recent documentation to a blog created for the purpose- http://cribstone.github.io/humblehacker/. The blog itself is very much a work in progress and will be reorganized into step by step instructions once its fleshed out. I'll either use this research note as a summary, or to highlight only aspects of the project that are specific to citizen science. Feel free to take a look and let me know what you think! This is what I was looking for! Really great poject! How is it going? Is the project still alive? Really looking forward to your end result.